If you’ve been in a blasphemous business of emptying your best bottles of Scotch whisky into any glass within reach, or worse, a plastic cup, it’s time to sit up and take notes. 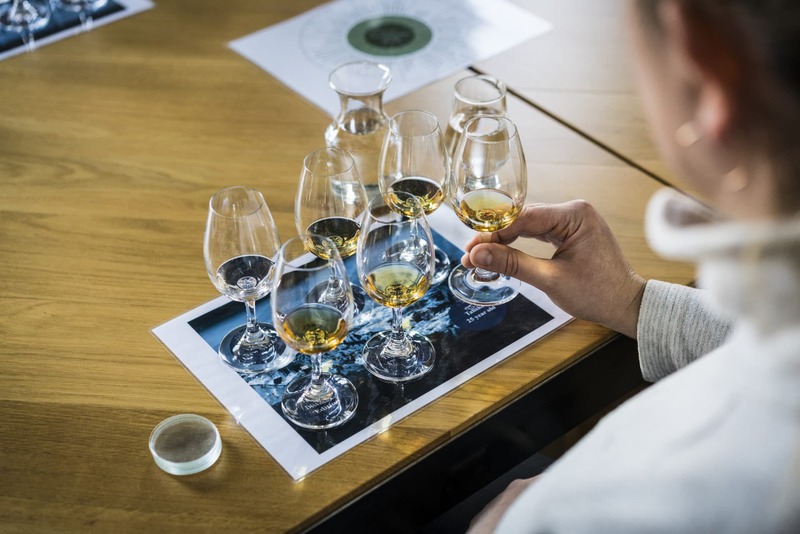 Like many prestigious spirits and wine, Scotch whisky is intensely complex and flavourful, boasting a diversity that has intrigued experts and blenders for centuries. It’s believed that there isn’t an absolute right or wrong way to drink your whisky, but just as how you never dream about pouring your finest Pinot Noir into a mug, you wouldn’t want to mar that precious Port Ellen experience by sipping it from a Pilsner glass. Here, a primer on the best glasses to complement your finest Scotch. Based on the copita — a Spanish glass traditionally used to sample sherry — this tulip-shaped glass is popular amongst connoisseurs and distillers for nosing. Its wide, rounded bowl allows for more aromas and flavours to be released, while the narrow mouth helps to concentrate these aromas, making it easier for specific characteristics to be picked up. The small, stemmed glass first made its way to consumers in the 17th century, when spirit merchants would use it to sample shipments at the docks before purchasing — hence it’s nickname, the “Dock Glass”. Inspired by the nosing glasses in whisky labs, the eponymous glass by Glencairn Crystal Ltd. is easily recognisable for its short, solid base with a thick glass body. This robust vessel has not only been a popular choice for social settings, but also an appropriate option for beginners, especially for those learning how to properly swirl whisky. As a modern relative of the tulip-shaped glass above, it bears a similar shape, only it’s specifically designed for whisky. Its rounded shape also directs aromas towards the narrowed rim and into the nose, effectively showing off any fine whisky to its full potential. These glasses are best for those who enjoy their favourite Scotch neat, or with a few drops of water. As intuitive as whisky appreciation can be, there’s actually a bit of science behind it – at least according to the guys behind the NEAT Glass. Abbreviated from Naturally Engineered Aroma Technology, the oddly-shaped, bowl-like vessel is the result of a fortunate mistake in a glass-blowing factory, which later revealed an exceptional ability to direct the lighter (but harsher) ethanol molecules away from the nose while retaining the heavier, more aromatic molecules. Using it will admittedly take some getting used to, but this just might be the perfect glass for those who strictly appreciate their whisky unadulterated. Also called a cognac glass or balloon, the snifter is recognisable as a short-stemmed glass with a wide base and narrow opening. While undeniably the most dapper glass to be seen with while holding a cigar, many believe the wide body and smaller rim of this glass are not conducive to the dissipation of alcohol, often releasing overpowering ethanol vapours that mask other aromas. While not encouraged for neat pours, the snifter is still popular choice for elaborate cocktails. Like the NEAT Glass, Austrian glassware Riedel created this glass solely for those who want to fully appreciate the depths of their favourite single malts. The cylindrical vessel features a short stem and dainty foot, which along with a fluted lip helps lift fumes away from the spirit to reveal aromatic notes of peat, especially in Islay whiskies. The most common choice of glass for convivial settings and at bars, the tumbler – otherwise also known as the lowball or old-fashioned glass – might not be the perfect option for nosing with its wide rim, but is a popular choice amongst those in the habit of having their scotch on the rocks. If you fancy one of the many classic whisky cocktails out there, the robust base of this timeless glass makes it ideal for muddling. Clearly the vertically-gifted sibling of the lowball above, the highball is unsurprisingly the best option for the cocktail it’s been named after. The scotch-and-soda classic has since evolved to also include ginger ale or lemonade, but regardless of mixer, the bar favourite is always served in this generous chalice.